ADJUMANI- More than one million children in West Nile, including newborns and adolescents, together with pregnant women, will soon benefit from better quality health services. The Swedish International Development Agency (Sida) has secured Shs 14,996,800,000 billion to strengthen health system for Maternal, Newborn, Child and Adolescent Health in the districts of Adjumani, Arua, Koboko, Maracha, Moyo, Nebbi, Packwach, Yumbe and Zombo. The latest figures in the 2016 Uganda Health Demographic and Health Survey indicate that the numbers of mothers who die in labour is still high despite a slight reduction from 438 in 2011 to 368 deaths per 100,000 live births. Infant mortality rate dropped from 54 to 43 deaths per 1,000 live births in the same period and SIDA fund will be dispatched to West Nile districts hosting refugees to build the capacity of human resource, re-equip maternity wards and sanitation facilities among others. Mr Per Lindgärde, the ambassador of Sweden to Uganda said this contribution has been planned to support around 480,000 children under the age of five, including 140,000 newborns, as well as 460,000 adolescents. Mr Lindgärde explained that they would be investing in the capacity of health providers, basic medical equipment, and water and sanitation facilities, to improve the capacity of health facilities in order to provide quality health services to host and refugee communities. “We are therefore happy to continue to support the strengthening of maternal, newborn, child and adolescent health services to children and families in West Nile, which is among the most disadvantaged regions in Uganda,” he added. The records add that it will also build the capacity of communities to demand and use quality health services and to promote social accountability through greater linkages between health facilities, health unit management committees and village health teams. 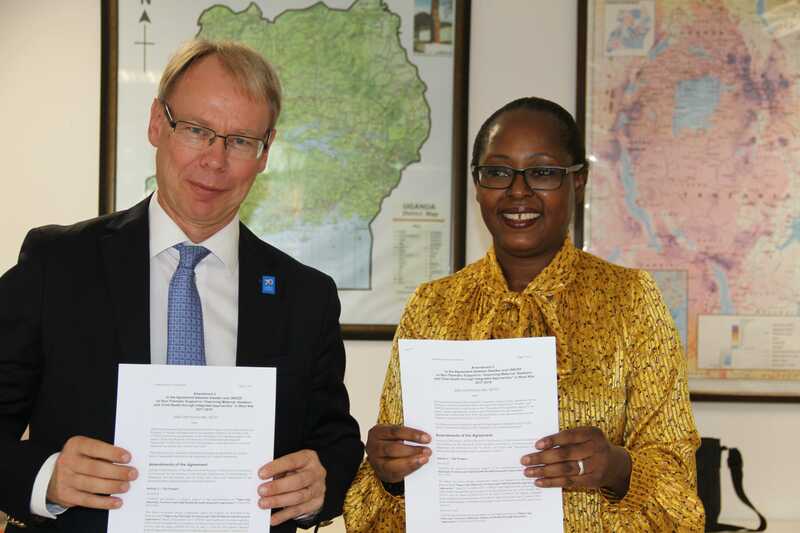 Dr. Doreen Mulenga, UNICEF’s Representative in Uganda said the new support from Sweden will help them to advance their vision and that it will ultimately improve the health and well-being of hundreds of thousands of children and save more lives. “UNICEF’s vision and plan is to support the Government of Uganda to build a strong and resilient health system that reliably delivers integrated health services for children, adolescents and reproductive-age women,” said Dr. Doreen Mulenga. Swedish International Development Cooperation Agency is a government agency, with the mission to reduce poverty in the world. SIDA carries out enhanced development cooperation with a total of 35 countries in Africa, Asia, Europe and Latin America. In Uganda, Sweden’s support focuses on three main areas; human rights, democracy, the rule of law and gender equality; environment, climate change and sustainable inclusive economic development, and; equitable health including SRHR. Sweden also provides significant support to research cooperation in Uganda. UNICEF works in some of the world’s toughest places, to reach the world’s most disadvantaged children. Across 190 countries and territories, we work for every child, everywhere, to build a better world for everyone. For more information about UNICEF and its work for children.